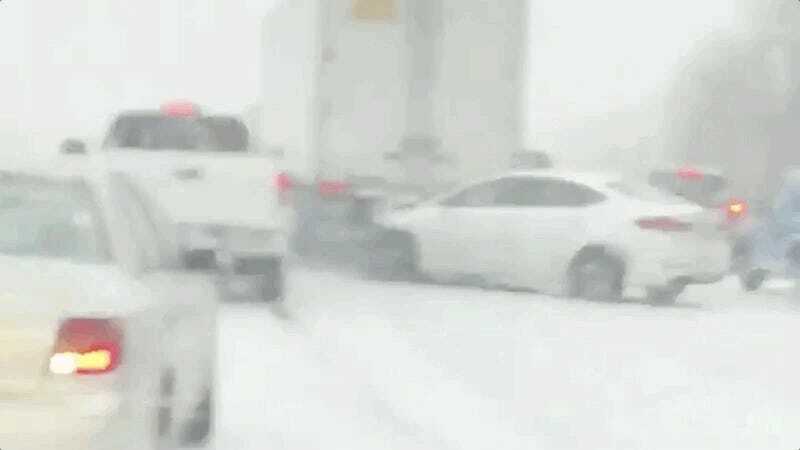 The snow and ice along I-44 in Missouri was bad earlier this week, as evidenced by an insane video from Monday showing one woman’s attempt to scramble from her car while slipping in the snow as a semi truck crashes into a pileup, just barely missing her. Here’s a copy of the video uploaded to Facebook. There’s also a copy on imgur. According to The Kansas City Star, the original source of the video is unclear. 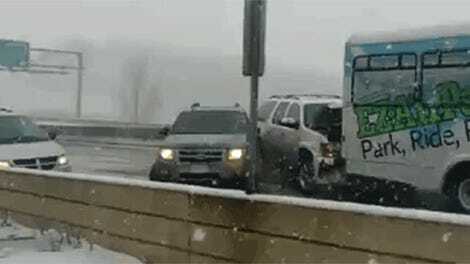 A second video captured the woman’s initial crash, which was just one part of a massive pileup in the bad weather on Sunday, according to KY3. The semi hit the stack of cars including Caroline’s. After the crash and her bold jump from the car, Caroline took refuge with the family in the truck that captured the second video. I have never seen a more insane non-fiction car crash clip in my entire life. The door, and the rest of the car AND the semi truck, all barely missed her by a matter of inches in her split-second decision to jump. It’s incredible she wasn’t seriously injured.